1. In large microwavable bowl, place cereal; set aside. In medium microwavable bowl, microwave brown sugar, butter, corn syrup, food color and cake mix uncovered on High 2 to 2 1/2 minutes or until mixture is boiling. Immediately pour over cereal; toss until well coated. 2. Spread on waxed paper. Cool 5 minutes. 3. In small microwavable bowl, place frosting; microwave uncovered on High 20 seconds. Drizzle over cereal mixture. Store loosely covered. 2. In 2-cup microwavable measuring cup, heat butter and chocolate chips on High 1 minute or until almost melted; stir and microwave another 30 seconds or until mixture can be stirred smooth; stir in condensed milk, heat 30 seconds or until boiling; stir in cinnamon. Pour over cereal mixture, stirring until evenly coated. 3. Microwave on High about 3 minutes, stirring every minute, until mixture is glazed. Stir in coconut and marshmallows. Pour onto waxed-paper lined pan to cool. 1. 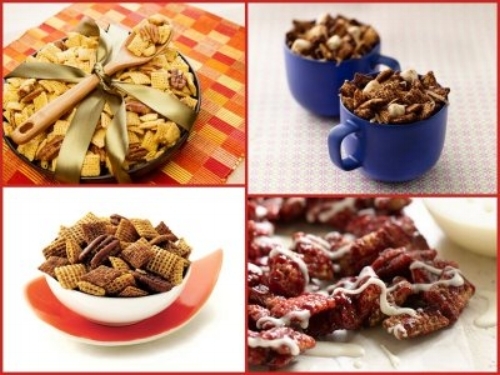 In large microwavable bowl, mix cereal and pecan halves. 2. In 2-cup microwavable measuring cup, microwave butter, sugar and corn syrup uncovered on High 1 minute; stir. Microwave about 30 seconds longer or until bubbling. Pour over cereal mixture; stir until well coated. Sprinkle dry cornbread mix over top; toss until well coated. Stir in corn kernel nuts. 3. Microwave uncovered on High 4 to 5 minutes, stirring every minute, until dry muffin mix dissolves. Spread on waxed paper or foil; immediately sprinkle with salt. Cool. Store in airtight container.